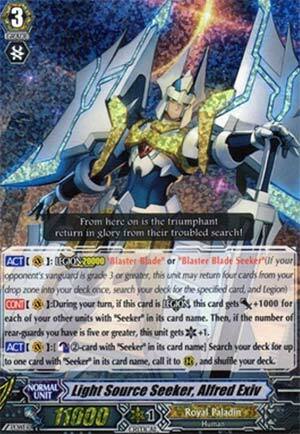 [ACT](VC): Legion 20000 "Blaster Blade" or "Blaster Blade Seeker" (If your opponent's vanguard is grade 3 or greater, this unit may return four cards from your drop zone into your deck once, search your deck for the specified card, and Legion) [CONT](VC):During your turn, if this card is Legion, this card gets [Power]+1000 for each of your other units with "Seeker" in its card name. Then, if the number of rear-guards you have is five or greater, this unit gets [Critical]+1. [ACT](VC):[Counter Blast (2)-card with "Seeker" in its card name] Search your deck for up to one card with "Seeker" in its card name, call it to (RC), and shuffle your deck. Oh yeah, Happy belated New Year to you guys, I guess. Alright, it's Seeker week, and in honor of the new Royals, we start off with Alfred. Yup, another one. This unit legions with Blaster Blade OR Blaster Blade Seeker (so if you legion with the former, you fulfill the requirements of placing it on VG circle and get to retire anything you want), and your reward? He powers up by 1000 for every other Seeker (including the mate, for a total of 6k max power) and then if you gathered 5 rear guards, he also gains a critical. His normal skill is to counterblast 2 Seekers and then summon a new Seeker from the deck. I think this card alone pretty much puts MLB Thing Saver out of a job. Think about it. You need to generate 6 total soul to use Thing Saver twice. Riding this, then Legioning alongside something like File, then riding Thing Saver generates 5, and after using Thing's skill, you have exactly 3 soul to start the fun again. Total loss incurred: -1, allowing for natural plussing over the turn. In comparison, Majesty Lord Blaster requires a -2 from the field, then riding Thing Saver for what is essentially the same strategy? Total loss incurred: -3. And Alfred at least has Mid Game crit like MLB. Yes, okay, maybe you have one extra soul, but you'd have to use Margal for the third shot, and the one extra card generated from Margal REALLY doesn't outweigh the heavy loss you incurred at the beginning. So you really are just better off with mono Seekers. For consistency if nothing else. Alfred Exiv is certainly not bad, seeing as how his Critical's pretty much free and he works towards Thing Saver's death train. He's replacing any other ace you can think of here. Light of the past, shine forth and bring a new future, enter the fray, the true King, Light Origin Seeker, Alfred Excalibur! Happy New Years, everyone. It's Seeker week and to start off we're looking at the King of the Seekers, Alfred himself. Now, Alfred here is neither a Type 1 nor a Type 2 Legion, so, I guess he's the Type 3 legion that the vanilla Legions are. That is, continuous. Anyway, Alfred here is a Dual Legion, that is, he can Legion with either Blaster Blade of the past or the present. ...Which is either Blaster Blade Seeker (Past) or Blaster Blade (Present). Oi, time travel hurts my head when I think about it. In fact, he was brought from the past into the present to fight off the Deletors, much like how, as a Liberator, he fought off the Invaders. As for the effects, when he's in Legion, he gets +1000 for each other Seeker on your side of the field. Which, it should be noted, includes Blaster Blade Seeker. And if you get 5 rear guards, which is easy to do for most Seeker decks, since most do searching and powering up, he gets an extra critical. So, with Blaster Blade Seeker, the Legion will be 26000/2 critical. Ouch. Most of the time, when a Vanguard gains a crit, it's not that great. Even with legions that rule still applies if that's all the Vanguard does. However, this guy's a Dual Legion, which means that he still works with the original version of Blaster Blade. And, it should be noted, if people are confused, that if you Legion with the original Blaster Blade, you have an on-legion retire ability. Granted, it's for 2 counter blasts, but you can retire any rear guard your opponent has when you Legion in that case. Dang, that's really good. But, wait, if this is Alfred, shouldn't he have some sort of ability to search? We already got the power up ability, so... Oh, right, the non-Legion skill. For 2 Especial Counter Blasts, you can Superior Call any Seeker to the field from the deck. Not much more I can say, as far as being a Seeker boss and a Seeker Legion, this guy's pretty much tops, even though STD is really good, compared to Alfred, STD only has one distinct advantage, which is against Link Joker, any other match-up, Alfred's just as good, if not better. So, if you're not running STD, you should be running Alfred, he's way too good to pass up. HAPPY NEW YEAR VAN-GUARDIANS!!!! And we are off to a great start!!!! We have the Legion version of the original Royal Paladin Alfred but by far a better unit. This is also the first and only Legion unit that can legion with two different cards. Very unique and allows for the original Blaster Blade to get some love again. So Alfred's effects are very cool, he gets 1k for each Seeker rear guard for when you are in Legion so allowing for additional 5k if you have those Seeker units and also gains an extra critical if you have five or more rear guards (regardless if Seeker or not). His third ability is a a special counter blast ability and it allows for you to help fill your field with a Seeker unit, pretty good especially with his second ability getting all kinds of unique effects when you have rear guards. Alfred was printed as a RRR, SP, and a Legion Rare.......WHY!! Far to many printings of him and his RRR will never go above $8.00 in value, where I think this card is meant to be considering there are far better cards you can play in a Seeker deck. My one and last final thing about this card is that in a Seeker deck he is very spashable because of Blaster Blake Seeker who literally can Legion with three other cards. That is all folks! !